A little less than a week ago, Xiaomi introduced smartphones Redmi 6 in China as the next generation Redmi smartphones. This is coming just days after the company introduced the Mi 8 flagships. The Redmi 6 is here as the successor to the Redmi 5. 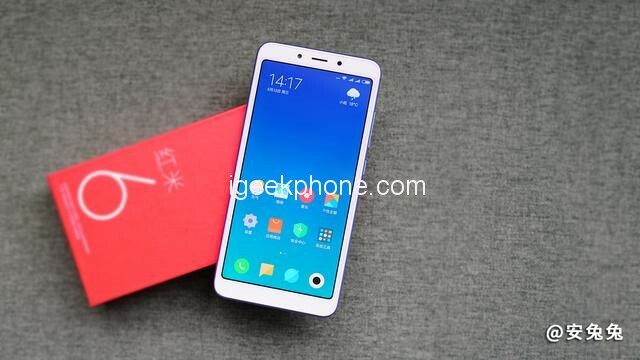 What is the upgrade Xiaomi do in it? How is the daily experience and is it worth buying? Ahead we will check in our Review, so let’s start it. See the Xiaomi’s Flagship Smartphone like the Mi MIX 2S, and Mi 8. When you see the Redmi 6, you feel it is very lite. The Redmi 6 is not only compact in size but also extremely compact in packaging. I believe many of my friends will have this feeling after they get this Smartphone. In fact, the length and width of the Redmi 6 are 147.5 x 71.5 mm, which is shorter and narrower than that of the Redmi 5 that was 151.8 x 72.8 mm. 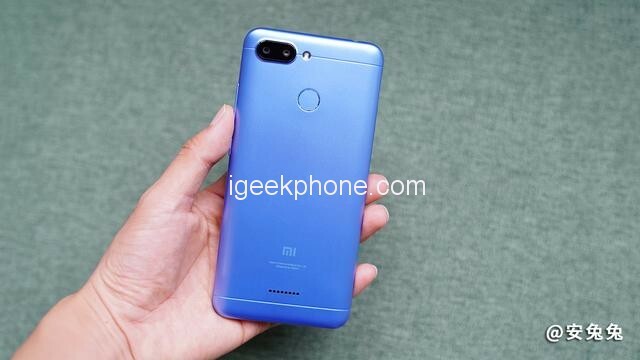 If you compare the data of Xiaomi Mi 8 (154.9 x 74.8 mm), Redmi 6 will undoubtedly become even smaller. The compact body makes the Redmi 6 very convenient to hold. 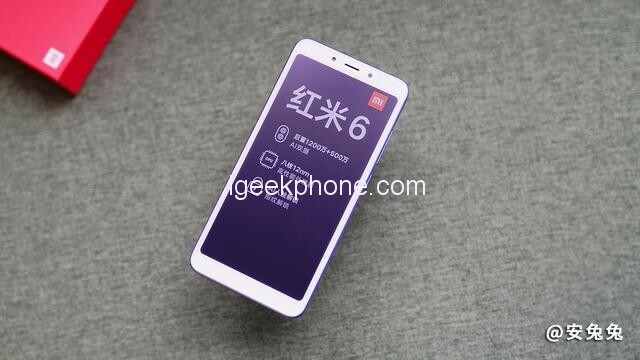 Especially after being accustomed to the “Flagship” Smartphone such as Xiaomi Mi 8, the comfortable grip of Redmi 6 is really long gone, and the size is just right. 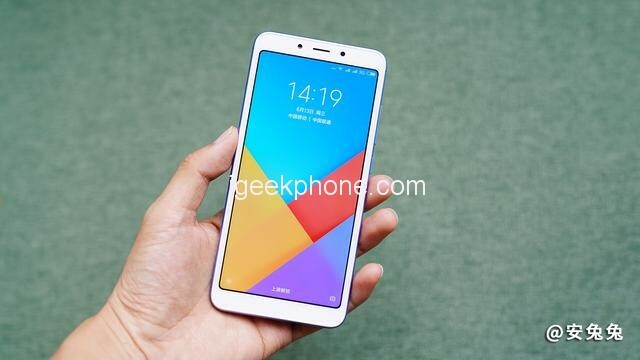 Although the Redmi 6 has a tiny body, it is equipped with a 5.45-inch (1440 x 720 pixels) 18:9 full screen, which has a larger field of view than the previous Redmi 4 (that is 5 inches). Of course, it is smaller than the Redmi 5 screen (5.7 inches). 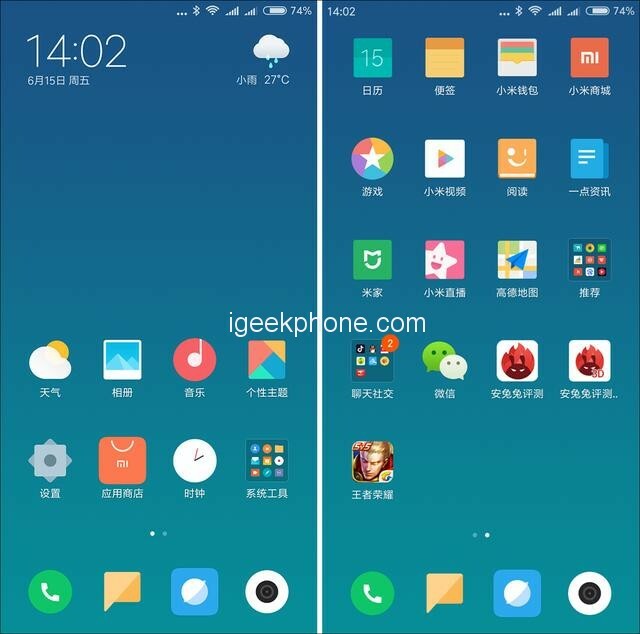 Xiaomi Mi MIX 2S and Xiaomi Mi 8’s full-screen design is gradually gaining in popularity, look at the 18:9 ratio full screen of Redmi 6, resulting in violations and feelings are normal. As technology advances, the needs of users increase. 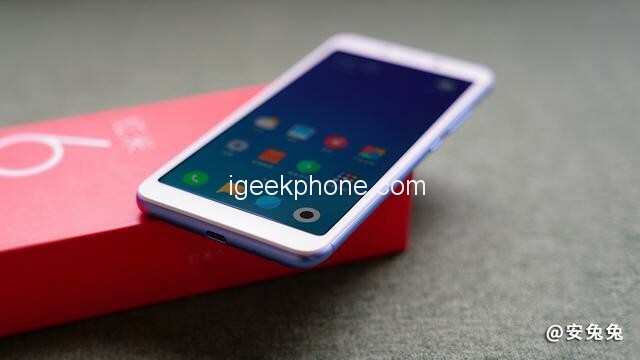 Xiaomi Redmi 6’s design tends to be simple and practical, and there is not much need to emphasize it. 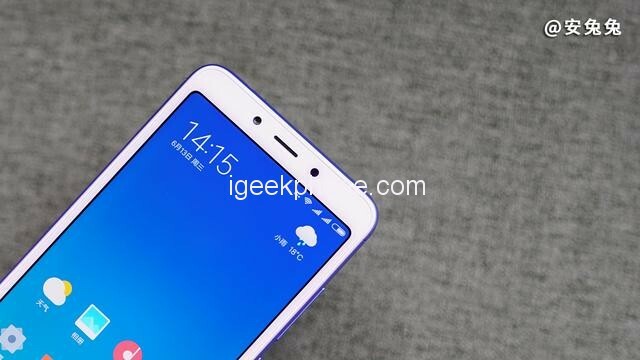 The only thing to point out is that the back uses a great design, with rounded arcuate transitions on the sides, similar to the inverted “C”, which greatly enhances the grip of the phone. In addition, it should be pointed out that Redmi 6 speaker placed on the back of the fuselage. This early layout was very common, and now it is less. If you want to play songs on the outside, it is necessary to place the back of the Redmi 6 in order to ensure the normal transmission of sound, without cover. As for color matching, Redmi 6 has four Grey, Blue, Gold and Rose Gold colors. 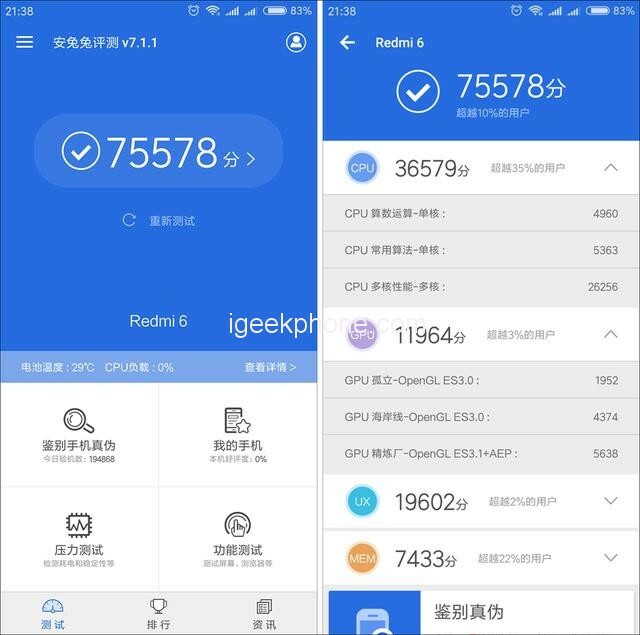 As the new Redmi phone, Redmi 6 uses a new MediaTek Helio P22 processor, again chose to embrace MediaTek, and is the global market first. MediaTek Helio P22 is an eight-core chip consisting of four A53 cores clocked at 2.0GHz and four A53 cores clocked at 1.5GHz. In particular, it should be pointed out that MediaTek Helio P22 uses a 12nm process, which consumes a lot less power than the 28nm process CPU. 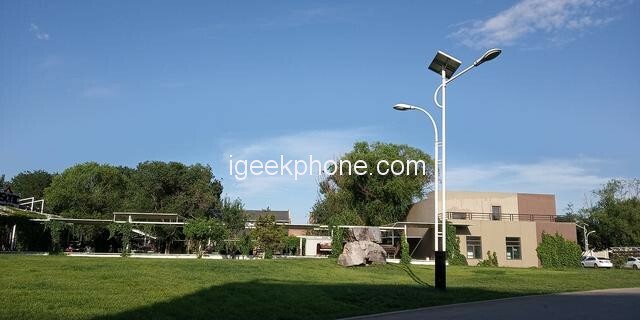 Now we decided to test the Xiaomi novelty at AnTuTu and find out the possibilities of the Helio P22. Recall, this chip is made on a 12-nm process technology and includes eight cores ARM Cortex-A53 with a clock speed of 2.0 GHz, as well as graphics PowerVR GE8320. 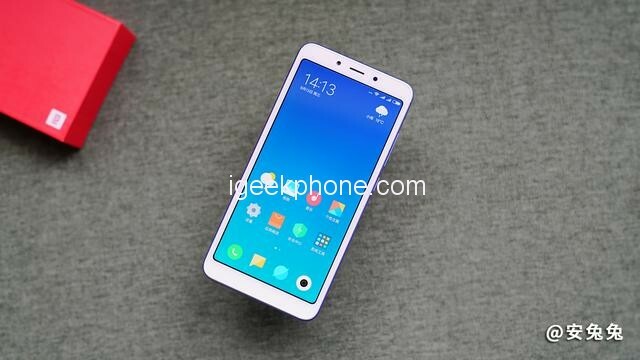 The result of the test was quite predictable – Xiaomi Redmi 6 scored 75,578, which is not much higher than the Redmi 5 – about 70,000 points. Of course, this test will not convince principled opponents of the production of Taiwan’s MediaTek, but nevertheless. 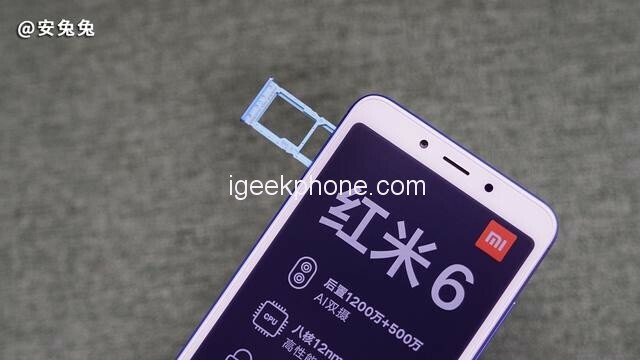 In fact, Xiaomi Redmi 6 is the world’s first 12-nanometer chip, which is of greater significance in the industry and will accelerate the iterative upgrade of thousands of chips. 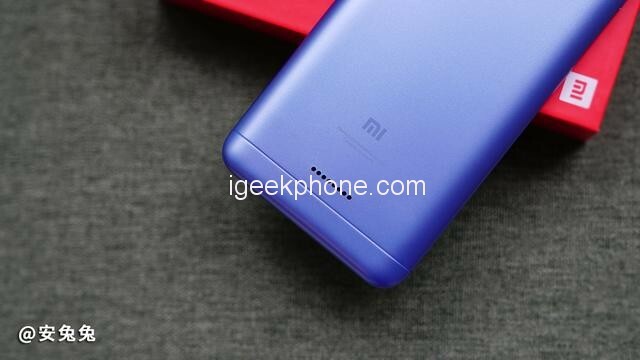 In terms of storage, Redmi 6 has two versions, 3GB + 32GB and 4GB + 64GB, which continues the previous sale price of Redmi 5, but the storage of the low-profile version is quietly upgraded. It is 3GB + 32GB. If it is only used as a backup phone, then you can choose 3GB + 32GB version; if the daily frequency is higher, you can consider increasing 200 yuan budget, buy 4GB + 64GB high version. 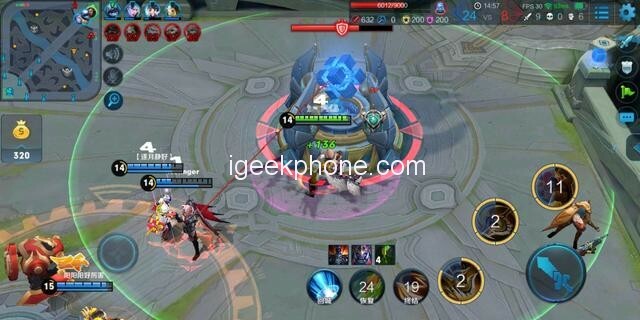 As for the 3GB+32GB version of Redmi 6, it is normal to play “The King of Glory.” In the default mode, the game frame rate is generally stable at about 30 FPS. 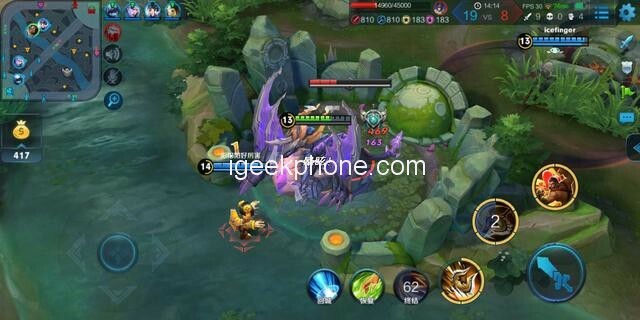 Due to its hardware level, the high frame rate mode is not recommended. 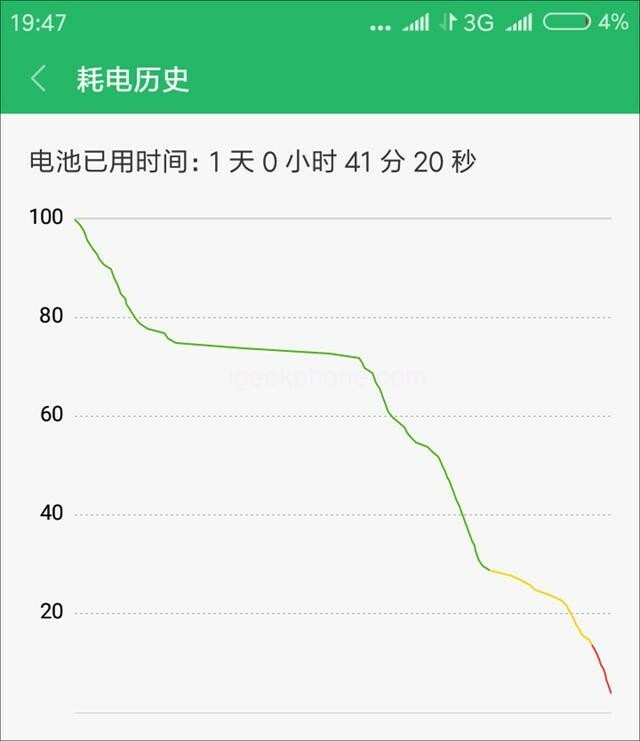 In terms of power consumption, the actual test confirmed that Redmi 6 hit 30 minutes of the “King of the glory”, the power loss is only 8%, lower power consumption. Normal use, for a light user like me, Redmi 6 with 3000mAh battery can support 1-day battery life. 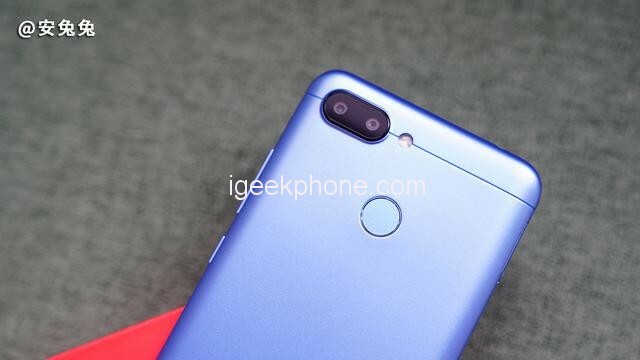 Like many high-end Smartphones of Xiaomi, Redmi 6 is also has a dual camera. 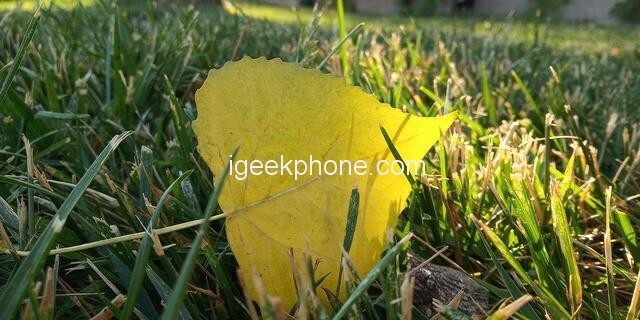 Specifically, it is equipped with a 12MP + 5MP dual camera with a 1.25-μm-large pixel, and it has a 5MP camera at the front. It also supports AI portrait mode and smart beauty, and it does not lose the high-end model of the Xiaomi. As far as the photo experience is concerned, the Redmi 6’s camera samples are transparent, the scenery is natural, and the macro can show a clear background blur, as shown in the figure. However, the night samples performed generally. Of course, it is only a mid-range smartphone that is available in just 799 yuan. 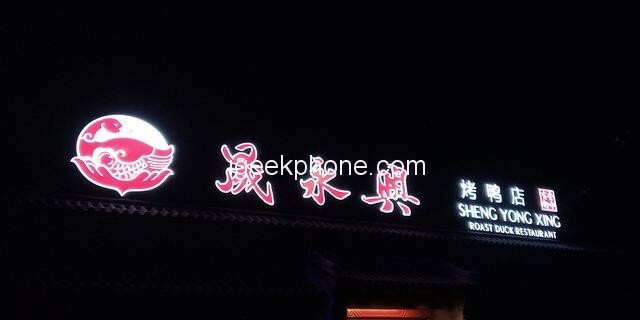 In addition, it is necessary to add that Redmi 6 camera not only supports the standard 4:3, 16:9 photo frame, but also supports 18:9 format. The personal recommendation is to select an 18:9 frame shot that matches the phone’s 18:9 screen so that the photo can be displayed in full screen. 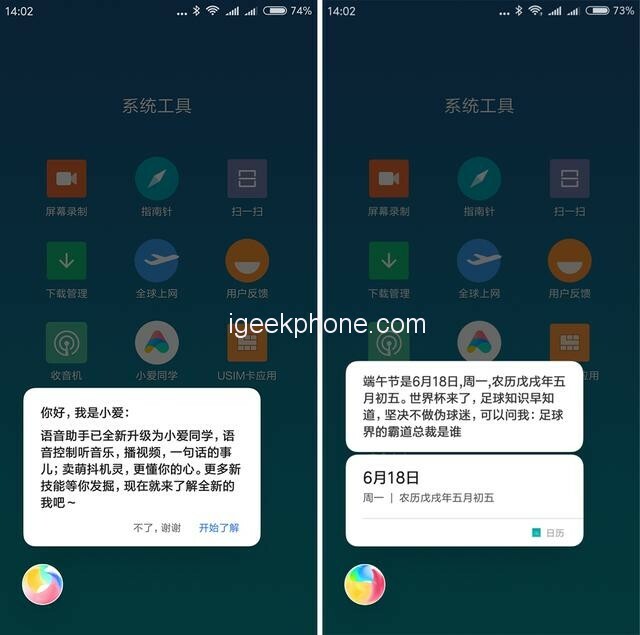 As for the system, the Xiaomi Redmi 6 in the hand is pre-installed with a stable version of MIUI 9.6 instead of MIUI 10. It has many familiar designs and functions. 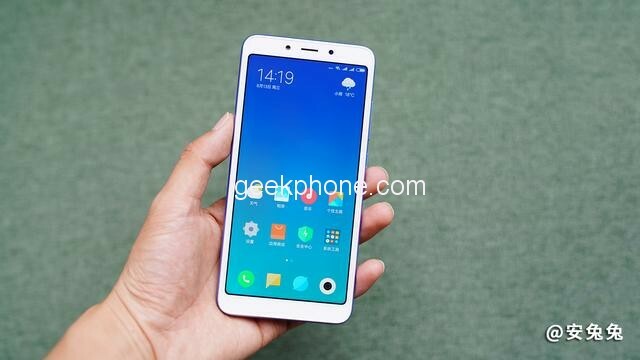 In particular, Redmi 6 has built-in a number of functions based on AI development, such as “Xiaomi AI” AI Face Unlocking, Smart Mutual Goods, Photo Translation ( System Tools – Scan), and AI. Pseudo base station SMS recognition function. For our own experience of a few days, Redmi 6’s AI face unlocking is very practical, and the newly upgraded “Xiaomi AI” also becomes more fun and smarter, and it is strongly recommended to experience. With the enhancement of the AI level, the gap between Redmi 6 and Xiaomi’s high-end Smartphones has further narrowed, which is undoubtedly a boon for users. After several days of experience, the Redmi 6’s compact body, comfortable grip, and MIUI’s user-friendly smart experience are all impressive. The starting price of Redmi is 799 yuan. If you want to choose a spare phone in the near future or buy a mid-range Smartphone for your parents, Redmi 6 is a good choice.